In recognition of his achievements as a member of the International Lawn Tennis Club of the United States, representing American teams in France, Spain, Luxembourg, Switzerland, New Delhi, India and Canada. His USTA national ranking in 1990, and consistent Eastern Tennis Association #1 or #2 Singles and Doubles rankings in the "45 thru 75" competition groups. His success at six quadrennial World Maccabiah Games and four Pan American Maccabiahs between 1981 and 2009, during which he won four gold medals and a combined nine silver and bronze honors. 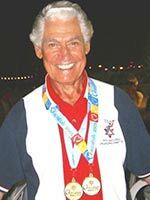 And in tribute to his service as Masters and Grand Masters Chairman of U.S. Maccabiah tennis teams; and long service as member of the Executive Committees of Maccabi USA Sports for Israel.